Grab yourself a horn of mead, your trusty battle axe, and braid that beard, you’ll need them to really get into the mood for Jotun, an incredibly gorgeous and atmospheric action-exploration game from Montreal-based Thunder Lotus games. I should preface this review by stating that I am a huge fan of Norse mythology and Nordic culture. Amon Amarth is one of my favourite bands and I was lucky enough to spend some time in Iceland this summer. So I was both hesitant and excited to play this game to see just how much research and care the team at Thunder Lotus put into what is, on the surface, a pretty simple game. Fear not, sons of Odin, while this game certainly lacks the brutality and violence I’ve come to expect from media dealing with Viking culture, the beautiful artwork, authentically Icelandic narration and clear love for the culture makes up for the absence of blood eagles and cracked skulls. In the game, you play as the aptly named Thora, a Norse warrior who must prove herself worthy of the gods to enter the Golden Halls of Valhalla. At the beginning of the game, you die, and throughout your journey to demonstrate your worth as a warrior to the Norse pantheon, you learn about the various gods, goddesses and animals that make up the mythology. Think of Jotun like a stunningly animated interactive learning cartoon. There is a hub world from which you access the different levels of Yggdrasil, the world tree, to solve puzzles, defeat the boss, and get the special rune to unlock your next ability. As you do this, you’re treated to bits and pieces of Thora’s life while simultaneously learning the tales of the Norse deities. The mechanics are fairly simple. You get two attacks, a strong and a weak, for fighting enemies, chopping down roots, and various other environmental manipulations. On top of this, as you unlock the runes for the various gods and goddesses, you also get special abilities to cycle through, such as a quick heal or summoning Mjolnir to boost your attack. Other than solving puzzles and cruising around the 9 realms, Thora is tasked with defeating various bosses. 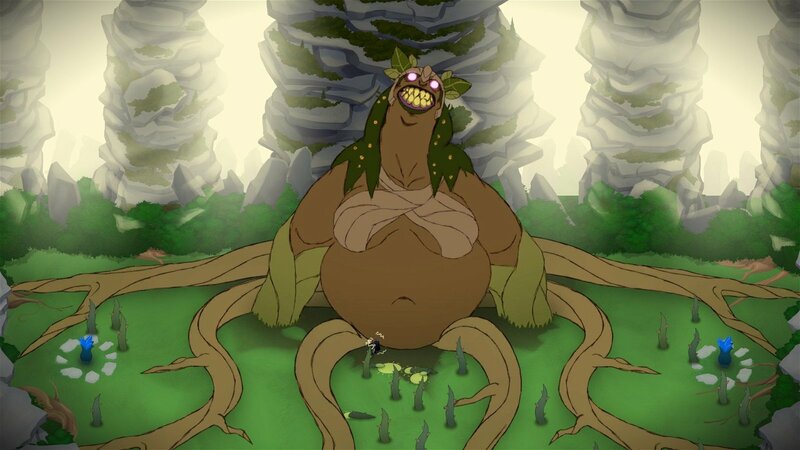 There aren’t any other enemies in the game, so those of you who enjoyed Shadow of the Colossus or Titan Souls will find familiar territory here. Each boss has unique attack patterns to figure out, and using your special abilities comes in handy as the game progresses. From a gameplay perspective, Jotun is pretty simple stuff. Where the game really shines is the graphics and artwork. Each frame is hand drawn, and each level of the World Tree has a distinct and gorgeous style. Whether you’re connecting constellations in a violet-hued night sky or clambering up the branches of a giant tree, every level pops with brilliant colours and a warmth that can be lost on bigger, more graphics-heavy titles. The music is lovely, switching from medieval strings to epic orchestral crescendos depending on where you are. 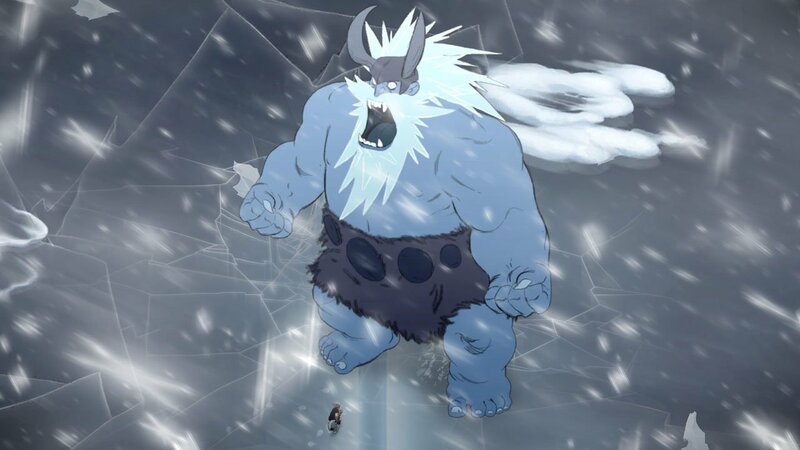 Jotun also retains its authentic atmosphere by having a legitimate Icelandic voice-over narrating your journey. The team said that Icelandic was the closest they could get to ancient Norse, and it works wonderfully. I’m so glad they decided against the generic, faux-British accent that almost every fantasy game uses. My only real complaints against the game are that it’s short, and there’s not much to do as far as deep combat or customization go. But clearly that’s neither the intent nor desire of Jotun, and that’s cool. It’s a wonderful, dazzling little world Thunder Lotus created, and you just might learn something while you’re playing. May you die with honour, sons and daughters of Odin. From a gameplay perspective, Jotun is pretty simple stuff. Where the game really shines is the graphics and artwork.